347 Russian servicemen died from January to May 2005. 333 US soldiers and marines died in Iraq from January to May 2005. An Islamic militant group said it planted a bomb that killed at least 10 Russian soldiers in the capital of Dagestan on July 2, 2005. An Islamic group in Dagestan Republic of Russia has threatened to extend its assassinations of police to not only police officers themselves but also to their families. 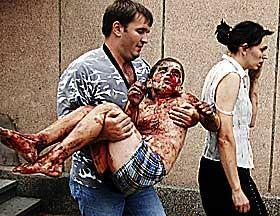 330 people were killed, including 186 children, on September 1-3, 2004 when terrorists attacked a primary school in Beslan, Republic of North Ossetia, Russia. On June 22, 2004, 570 Chechen and Ingushetian “mujahedeen” slaughtered up to 90 people many of them police officers in Ingushetia Republic of Russia. 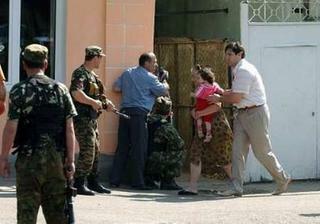 Civilians run for cover as Russian forces battle rebels in Dagestan’s capital of Makhachkala on July 6th, 2005. On August 20, 2005, a blast took place at on one of the main thoroughfares of the Dagestani capital of Makhachkala and not far away from a reception hall where a wedding was taking place. Three officers were killed. 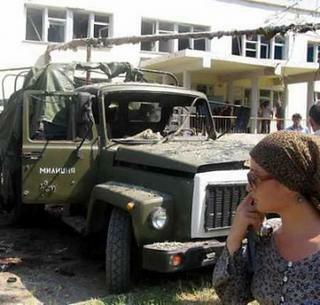 A homicide truck-bomb, killed at least 44 at a military hospital in Russia on August 1, 2003. On October 13, 2005 Chechen Terrorists Attacked Russian City of Nalchik in the most extensive terrorist assault ever carried out on a whole city. 61 terrorists and 24 civilians and military personnel were killed in the attacks. At least 10 people died in a Moscow subway suicide blast on August 31, 2004. 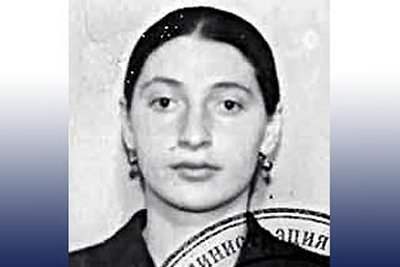 The subway suicide bomber, Roza Nagayeva, is the sister of Amnat Nagayeva, who is one of the suspected suicide bombers in the double plane crashes that killed 90 people after take off from Moscow on August 24, 2004. In 2004, Russia lost conservatively 1,100 military men and women. In 2004, the US lost 848 soldiers and marines in the Iraq War. The question is then, if the Honorable John P. Murtha were Russian, would he argue to pull Russian troops from Chechnya, Ingushetia, and the North Caucasus? Or would he suggest that the Russian troops withdraw from Moscow as well? Update: (Sunday AM) And, if the Honorable John Murtha were Paksitani, you could be assured that he would be near the point of withdrawing Pakistani troops from the tribal areas of Pakistan after losing over 250 troops there the past two years. The casualty rate of all deaths in Iraq (with BOTH the Allied Forces AND Iraqi Civilians COMBINED) is equal to the Pre-Katrina murder rate in New Orleans (.05%)!